Cover Liner Janabebé for FRONTAL ACCESORY CYBEX GOLD SOLUTION M-FIX +CYBEX GOLD PALLAS M-FIX Optimum seat protection for children against dirt and wear. This product is not made by third party brand "Cybex", is made by Janabebé. Details: cover made of 95% cotton and 5% lycra. It is placed on the chair as it comes, it does not substitute the preexisting cover or fabric from the manufacturer. Quick and easy to put thanks to its elastic edges. Your car seat will look like new even after prolonged use. Very nice for your children, cotton has a number of properties that makes it ideal for contact with the skin and provides the optimum climate and comfort of your kids on the car seat. The cover prevents wear and tear of the chair itself, keeping the chair as new longer. The product sold is the cotton cover, in no case it includes a car seat. Do not miss the rest of our Janabebé products! Cover Liner Janabebé for FRONTAL ACCESORY CYBEX GOLD SOLUTION M-FIX +CYBEX GOLD PALLAS M-FIX Optimum seat protection for children against dirt and wear. Details: cover made of 95% cotton and 5% lycra. It is placed on the chair as it comes, it does not substitute the preexisting cover or fabric from the manufacturer. Quick and easy to put thanks to its elastic edges. Your car seat will look like new even after prolonged use. Very nice for your children, cotton has a number of properties that makes it ideal for contact with the skin and provides the optimum climate and comfort of your kids on the car seat. The cover prevents wear and tear of the chair itself, keeping the chair as new longer. 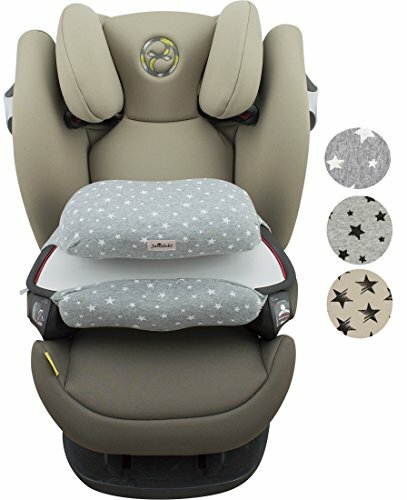 The product sold is the cotton cover, in no case it includes a car seat. Do not miss the rest of our Janabebé products! If you have any questions about this product by JANABEBE, contact us by completing and submitting the form below. If you are looking for a specif part number, please include it with your message.